Good thing you’ve found the t-shirt experts at OneHourTees. We’re not only obsessed with printing incredible custom apparel. We also want nothing more than for them to last you a lifetime. Check out our ultimate guide on best ways wash t-shirts for longevity. The absolute worst thing you can do to your precious tees is to throw them in the wash all willy-nilly. In fact, it’s mostly what you do BEFORE sticking them in the machine that’ll make those shirts last for ages. This isn’t just about sorting things by color—though that’s always a smart idea. What’s actually more important is separating your apparel by fabric type, texture and level of filthiness. Think about how the clothes in each load will interact with each other while tumbling around together for the next two hours. Keep anything with rougher textures or things like buttons, zippers, and bedazzles away from anything with a printed design or a fragile fabric. For example, throwing a pair of jeans in with a soft, screen printed tee will not only create substantial pilling, but also wears away at the design. And as for sorting the slightly soiled clothes from the ones that powered through a muddy game day—this is so any apparel that doesn’t actually need an ultra rigorous wash won’t have to bear the extra intensity. Even though you’ve sorted all of your printed tees together, friction against any apparel can be bad for longevity. To minimize the impact against the actual design, always turn your custom printed tee inside out before washing it. This will help protect the artwork from washing machine wear and tear. Also, since most of your sweat and smells come in contact most closely with the inside of your shirts, this allows for the stinkier spots to get the most thorough, direct clean. We recommend washing apparel inside out for all of our custom shirts including DTG, screen printing, embroidery, and heat transfers. Overdoing the detergent not only causes its chemicals to gradually wear away at apparel, but also can actually make make clothing smell worse. This is thanks to soaps essentially sealing odors into the tees. Your tee might smell great as soon as it comes out, but the scent will come back with even more intensity later. Every load and every washing machine is different, making it hard to provide an exact perfect measurement. However, chances are that half of the recommended measurement will work great. You can always add a little more next time if you don’t believe it’s enough. The hotter the water, the faster it wears out your clothing. Unless your tee is seriously filth-ridden, there really is no reason to use anything but cold water, even if the tag recommends otherwise. You can even purchase detergent specially made for cold water, like Tide Plus Coldwater Clean to ensure peak cleanliness, no matter the temperature. 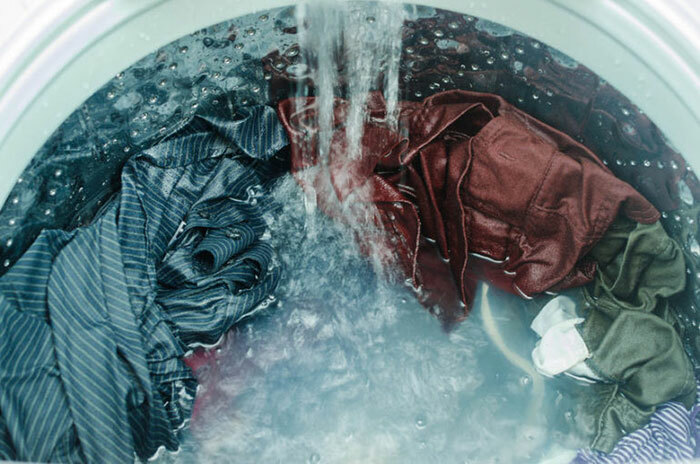 Again, like cold water, most clothes don’t need the highest wash setting to get a good clean. Higher intensity washes can significantly break down fabrics and designs much more quickly than necessary. Only go heavy duty on the clothes that really need it. If you’re like many people, you don’t even think twice about throwing your freshly washed tees into the dryer and cranking it on high. However, this is one of the worst things you can do for the longevity of your apparel. Unless you’re in a massive rush, there’s never a reason to use the highest dryer heat settings. By causing cracking, fading, shrinking, fabric damage, and more, high heat is the worst culprit when it comes to damaging custom printed designs, and honestly the overall quality of any apparel. Heat also intensifies odor so any scents that managed to stick are more likely to reappear. We get this might not be the most ideal option if you’re say, living in a tiny apartment in the middle of a Chicago winter, but if you have the space, air drying is a fantastic option for several reasons. Not only is it the best choice for your clothes with no tumbling and no extra heat, it’s also great for your energy bill and overall energy consumption. It might take a little longer, but by purchasing a basic, affordable drying rack and placing your damp clothes in an airy room, expect everything to dry out much more quickly than you might think. Always iron your custom printed tees inside out and place it on the lowest setting possible. As mentioned above, heat destroys designs more than anything else. Sometimes we gotta get those wrinkles out, but try to put as much distance between the art and the iron as possible. Folding shirts is actually better for the fabric than hanging them up. This is because gravity gradually pulls down on the shirts causing them to slowly stretch out. If you can’t completely forgo hanging, at least rotate your folded shirts with your hung shirts every few months to give the hung shirts a break. Now that you’ve accomplished every step to perfectly wash your shirts for longevity, don’t let little things like moths, light, and moisture won’t ruin your favorite tees. Keep all of your apparel in a dark, dry place. Light causes colors to fade and dampness can quickly turn into mold. Lastly, it never hurts to throw a few moth balls into the drawers or closets, ensuring no nasty little holes are gnawed into your favorite tees. Now that you’re an expert at washing custom printed tees, how about creating some new ones to love? Trust the amazing team at OneHourTees to make all of your t-shirt dreams come true. We’re dedicated to delivering only the highest quality apparel and designs nationwide for any event—or just for fun. Call us at 773-687-0520 or get a free online quote anytime.